Mumbai is rapidly becoming a place for chosen few. Chosen, on the basis of money. The rich, famous and self-proclaimed law abiding citizens of Mumbai were first shocked and then laughed at the misery of families of 75 innocent lives that were lost in a tragic building collapse in Mumbra, near Mumbai, last month. “How ignorant can one be? Buggers should’ve checked whether the building is authorized or not. Illiterate people, I tell you,” said one of my friends on Facebook chat. He sent laughing smiley (:D) at the end of the chat. He perhaps didn’t know that, these slum dwellers were purposely told to move inside building, to avoid demolition from civic body. It’s a win-win situation for both builder and a slum dweller. The former gets his construction legalized on humanitarian ground and the latter gets a ‘pukka’ house. Following the Supreme Court verdict, the Brihanmumbai Municipal Corporation (BMC) slapped the notice of demolition on 35 floors of seven buildings of upper middle class, upmarket locality. The demolition means that 140 families will have no roof from May 2. As you must have predicted, none of them is illiterate or ignorant or poor. They were not given water connection for past 25 years by BMC, mainly because the structures were unauthorized and that was enough for them to know that builder has cheated on them. Yet, they continued to live in those unauthorized buildings for 25 years. Ignorant, aren’t they? My friend on Facebook, please answer. Why do you think you are different? Don’t you understand that you too were as cheated and fooled by builder as those homeless families by some other builder, when he convinced them to construct slums on open plot? Just to claim that land under Slum Rehabilitation Scheme, few years later. You both wanted a house. The only difference was your class. You managed a house on 17th floor, while the homeless managed a slum besides a dumping ground. Neither his slum’s nor your flat’s plans were approved by authorities. You are no different than him. Remember that! You are all the victims of land sharks, corrupt system and the nexus between builder-authorities and politicians. After all everyone dreams about a house. Builders, politicians and authorities have used the situation wonderfully in their favour and have kept the housing prices away from the common man’s range. It is the desperation of people that is forcing them to live in worst of the conditions, many a time in unauthorized buildings. After the incident in Mumbra, the Thane Municipal Corporation (TMC) took a decision to demolish ‘dangerous’ and ‘unauthorised’ buildings. All the political parties in the state, except for Mahrashtra Navnirman Sena (MNS) and Bharatiya Janta Party (BJP), called for a bandh. “It will make people homeless and they are not guilty,” they said. You are right! But don’t you think you should have also asked for action against builders and officials who constructed these unauthorized structures? Congress, Nationalist Congress Party (NCP) and Shiv Sena, who had supported the bandh, did not bother to utter a single word against the builders. So obliged they are to the builders, it seems, for reasons best known to them. Mumbai’s Golibar slum redevelopment is also one of the examples of utter disrespect to law by builders. Forged documents, threats, hooliganism and even an alleged kidnapping, tells the sad story of legitimate slum dwellers here. Alleged involvement of big politicians in the redevelopment has forced ‘independent’ media houses ignore the misery of these people. Then there are examples of Sion-Koliwada redevelopment, Ganpat Patil nagar redevelopment and the list goes on. The builder lobby has gained upper hand everywhere with the help of police, politicians and officials. So, my dear lady from ‘n’th unauthorized floor, my humble request to you is, don’t say you are different, just because you are rich. You both are the victims. Criticise the system, which has put you in this condition, not the slum dweller. 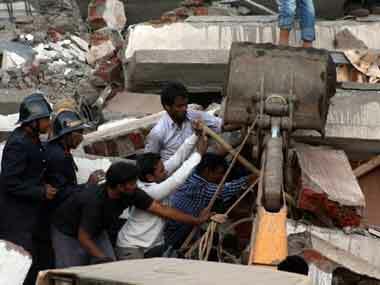 Demolition of illegal Mumbai flats: Why hit the innocent? There is this often narrated anecdote, surely apocryphal, where a mischievous student’s parent tells the teacher that the boy is sensitive. If he errs it would do if the next student is slapped and his son would get the message. That was, of course, before corporal punishment was outlawed. To expect such hints to be taken by people who occupy illegal structures in Mumbai or in any city is absurd. It applies well to the move of the Mumbai’s civic body to demolish 140 apartments on 35 floors across seven apartment buildings in Worli. It was not a spontaneous action from the civic body, it was ordained by the Supreme Court. The Municipal Corporation of Greater Mumbai (MCGM) has now made the headlines by the simple fact of speaking about how it has drawn a logistic and supervisory strategy to do so in three months, as The Times of India reported on Thursday. It mentioned, how, rightly, the residents were unnerved. One would be surprised if they were not. The demolition plan is terrible news mostly since it is an entirely wrong way to go about the business of illegal constructions, which of course, are rife in the city. Simply because the Supreme Court ordered it for violations of civic laws also does not necessarily make it right. There are many more which have deviated from the rules. The civic body, in the cloud of the dust raised by the collapse the Mumbra building which took 74 lives, has but to act on the apex court’s order which bars the residents from seeking regularisation of the illegalities. It naturally leaves them with no option but to take recourse to a review petition. By making a virtue out of the order, talking about new techniques without disclosing the details as to how the flats would be brought down, and saying that about Rs 1.5 crore would be spent towards complying, MCGM simply cannot escape its responsibility in having allowed such nonchalant law-breaking. What about the shamble in which the residents of other apartments would have to live in, during the demolition? It is assumed that they or the worth of their property does not matter at all. The collateral damage to them is hard to imagine. Not bringing the unauthorised apartments down would be contempt of court, but allowing them to have come up in the first place itself requires a judicial enquiry which can and should hold the process and the participants in it guilty as well. We have hardly heard anything much about those who perpetrate such frauds, of being held accountable. Had the Supreme Court only asked the MCGM to bring before it all the cases of violations and then their regularisation, say during the past one decade, it would have helped bare the unbelievable extent of the mischief played by the real estate interests and civic officials in cahoots. Those interests include politicians. There are likely to be more illegal buildings or parts of buildings than there are those among them which should have attracted the demolition crews of the civic body. The very fact that they did not is itself a testimonial admission of the civic body’s culpability. Except, of course, we don’t know which are illegal and which not; even the buyers did not. This does not at all mean that enforcement of law has to be only selective in the sense the builders who come up with the grand designs to cheat and then, with ever-eager willingness of the civic officials, often at the behest of politicians who urge everyone to wink at the deviations, can go scot free. Mumbai’s civic body and its counterparts in other cities have avoided universally applying the building code—from floor space index to eligibility of a site to host the structure, including the structural quality, explaining the violations if—only if—exposed and act seemingly responsibly thereafter, up to a point before resuming their mischief. It is a lot cheaper to do a job honestly and efficiently than cope with consequences. This common sense approach abundantly useful to ensure reliability of a civic body is missing in their administrative culture across cities. Because adhering to the proper ways would lead to huge losses by way of illegal incomes. It is as if the citizen is not at all a stakeholder. Those who stick to their statutory duties are often dismissed as cranks, as GR Khairnar was. Had Khairnar only done his job without running at the mouth, and grabbing headlines, he perhaps would have been better off. But had he not, looking at the flip side, he would have been smothered by the corrupt in the system. The system that protects wrongdoing is much more competent than the other citizen-centric work as per law. It cannot be anyone’s case that Mumbai or for that matter any city’s illegal structures, from lean-tos on sidewalks to slum colonies to elegant multi-storeyed apartments, should be allowed. Well-performing cities ought not to allow them to even emerge, leave alone mushroom. If they do, there are undermining their own stated purpose. They are allowed to mushroom and then, amid outcries—often maybe because the right bribe was not paid—make the innocent buyer almost invariably the casualty. Even the slums that crop up hither and yon with near impunity from the civic demolition squads have been blessed by politicians and as the recent case of an entire corrupt police station lining up for bribes showed, everyone is on the make. Then why leave the victim thrashing about after being targeted by the real estate industry which not only makes housing unaffordable but also runs a racket hand in glove with those who ought not to have allowed it in the first place. If this Worli pattern becomes the chosen way, large chunks of Mumbai residents would be on the streets sans a shelter even as the jails remain empty. from April 4, 2013 at Golibar, Mumbai. common practise to lure societies into signing a deal with them. pro-Builder scheme. This needs to be rectified. But why redevelop slums? Aren’t they illegal in the first place? squatting, but instead because of a lack of low-cost housing options. options that the poorer people cannot afford. So is SRA the only scheme for redevelopment? Why now? What’s the urgency? people are robbing the common man of a basic right to shelter. large slum without inviting tenders. were carried on in Ganesh Krupa Housing Society. then it stands tall on Mumbai’s coast, working class of Mumbai asks ? indefinite fast to get justice once again, within a span of two years. What’s the history of Ganesh Krupa Society? The slum housing the Ganesh Krupa Society consists of 324 tenements. demolished, and 43 houses on April 2-3, 2013..
this, and other projects of Shivalik Ventures, to the 2G scam. joint venture company, Shivalik Ventures Pvt. Ltd. An Amount of Rs. Construction Company to jointly develop Ganesh Krupa slum at Golibar. 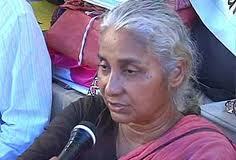 Why is Medha Tai Patkar on an indefinite fast again ? Secretary, Housing Mr. Debashish Chakravarty is completed. discontinued and others decay in transit camps for years. builders and SRA for the 6 projects where 3k has been applied. including Shivalik – a part of 2G spectrum scam. Review SRA scheme itself and modify it to allow Self-development as an option. through the model of self development. carry on slum improvement with basic amenities. provision in the Nagar Raj Act. the cut off date is year 1995.
families at a priority basis. their rights to housing denied. Chaiperson, National Human Rights Commission Delhi. South Block, Raisina Hill, New Delhi. India-110011. Telephone: 91-11-23012312. Fax: 91-11-23019545 / 91-11-23016857. Gujarat High Court on Friday expressed satisfaction about the progress made by CBI in the investigation of Ishrat Jahan fake encounter case, and ordered it to submit the next progress report by May 9. CBI, ordered by the HC to take over the probe in December 2011, on Thursday submitted a progress report in a sealed cover. On Friday, the division bench of Justices Jayant Patel and Abhilasha Kumari said the pace and direction of the probe were satisfactory. “It looks like in past two months CBI has made a substantial progress,” the judges said. At the last hearing in January, when CBI submitted its first report, the court wasn’t much happy and decided to monitor the probe. Subsequently, CBI arrested four Gujarat police officers: IPS officer Girish Singhal, deputy superintendent of police Tarun Barot, inspector Bharat Patel and retired deputy superintendent of police J.G. Parmar. Ishrat Jahan, who hailed from Mumbra near Mumbai, Javed Shaikh alias Pranesh Pillai, Zeeshan Johar and Amjadali Rana were killed by the Gujarat police in an encounter on June 15, 2004 on the outskirts of Ahmedabad. During the hearing, the state government’s lawyer raised the issue of sending back Gujarat-cadre IPS officer Satish Verma, who had been asked by the HC to join the CBI probe despite the state government’s objection. Mr. Verma was a part of the Special Investigation Team constituted by the HC in this case; he was the first to say in his report that Ishrat and others were killed in a fake encounter. “We need him urgently as he is one of the senior and experienced officer of the state police,” Government Pleader Prakash Jani said. Mr. Verma could be sent back to state service as CBI had now made a substantial progress in probe, he said. “As per this court’s order dated January 11, 2013, Mr. Verma’s services for this case were allowed only for three months,” he said. But the bench, while rejecting CBI’s request for continuing Mr. Verma’s deputation for four months, said he can continue to assist CBI till April-end, and by then CBI should get done whatever it wanted him to do for the probe. “From May 1, 2013 Satish Verma should return to the state government,” the HC said, fixing the next hearing on May 10. A teenaged girl jumped out of a moving autorickshaw to save herself from the clutches of three men, who allegedly tried to molest and kidnap her, in Mumbra township of neighbouring Thane district, police said on Friday. The 17-year-old girl boarded an autorickshaw on a shared basis along with two men in Mumbra yesterday morning. However, when she realised that the autorickshaw driver was taking the vehicle on a different route, she raised an alarm, police sub-inspector Chihvad Shetty said. But, the men sitting besides her allegedly tried to molest her in the moving vehicle and assaulted her. However, the girl managed to jump out from the moving vehicle to save herself and later went to Mumbra police station and filed a complaint against three unidentified persons, including the autorickshaw driver, Mr. Shetty said. Police have registered an offence under sections 366 (abduction), 354 (assault or criminal force to woman with intent to outrage her modesty) and 323 of the IPC and have launched a search for the accused. A similar incident was reported in Bihar’s Bhojpur district on Thursday where a woman jumped from a speeding express train to escape from molesters, who were identified as army jawans. Invitation for a Film Treat at TISS- May 8, Block it !! The School of Media and Cultural Studies invites you to a screening of a series of five final films by the Class of 2012. The film screenings will be followed by an interaction and discussion with the filmmakers. The details of the films follow. plays cricket. The two have very little in common, but there is one thing that binds them- Breaking, a dance form that started back in the 70s in the Bronx, New York. Since then, it has grown popular across countries and has moulded itself to fit into specific cultures. subaltern youth cultures and what it means to win and lose battles. Through the personal lives of Gani, Aman and their friends, the film tries to understand the dynamics of breaking, and explores questions of space and the avenues for leisure in Mumbai. The riots of 1992-93 changed the spatial character of the city of Mumbai.While some Muslims left the city out of choice others were forced to leave in search of security. It was in this context that Mumbra, a Muslim ghetto, was established. Niswa-E-Mumbra is a film that explores the lives of Muslim women in Mumbra, through two central characters. Shireen Kamal Dehlvi is a journalist working with an Urdu daily. With her stories of struggle she brings to life what it means not just be Muslim but also a woman in contemporary times. Kausar is an activist working with a women’s organisation called Awaaz-E-Niswan. Through her working on women she throws light on the present infrastructural problems in Mumbra and the struggles they pose for women. The film dwells on questions which attempts to answer weather the life of a Muslim woman is any different from that of other women. At the heart of Mumbai’s mill country, Lalbaug-Parel, stands Bharatmata Cinema, one of the remaining single screen theatres that plays only Marathi films. The theatre is an iconic reminder of a colourful working class culture which is now on the decline in Mumbai. Through the narratives of Kapil Bhopatkar, the owner, and Baban, one of the oldest employees of the theatre, the film explores the history and development of Bharatmata as a space for articulating the cultural identity of Mumbai’s working class and ponders on its existence and survival. The characters, though from widely disparate socio-economic classes, come together in their passionate love for cinema and their celebration of the main character in the film, Bharatmata Cinema itself. From the echoing hills of the North east to a bustling city of Mumbai by the sea, the film is about the people who have made this journey in search of better life. But does the journey end here? Amidst the changes and negotiations, the search for familiar faces and flavours of food lead them all to Kalina. In the film, a musician, an entrepreneur, a researcher, a homemaker and a martial art trainer, reflect on their lived experiences and the efforts to recreate their homes and maintain their identity in the city. The film explores Kalina as a space and the elements of food and music which link them to their homeland and its memories. This is a film on the performing artists of Tamasha and the changing facets of art form itself. Women have been an integral part of Tamasha contributing on and off stage. Their lives and struggles are a result of the interplay between social constructions, the changing location and form of Tamasha. Kanthabai Satarkar is a veteran Tamashgir. With her first performance at the age of nine, she grew as an artist to manage one of the biggest Tamasha troupes in Maharashtra. With over six decades of experience, her life bears witness to the journey of Tamasha and lives of those associated with it. In a modest flat off a dusty lane in the Muslim-majority town of Mumbra, a group of young girls is sitting in a semi-circle. Before they entered the apartment, they were all covered with the black veil, the unofficial dress code of any conservative Muslim mohalla in the subcontinent. But now, faces kissed by the sunlight, they await their turn at something equally liberating: poetry. The young poets, initiated into the art two years ago, are gearing up to celebrate International Women’s Day on March 8 with yet another poetry recitation session. Emotions-some raw, others mature beyond their tender years-flow as the girls’ words become banners of dissent. Their poems protest the many inequalities that women face-female foeticide, financial dependence on men, unrequited love and the curses of divorce and widowhood. The group came into being after Iranian-American poet Roxy Azari conducted a two-month-long poetry workshop for the young women in 2010. Azari, then on a Watson Fellowship, toured seven countries to engage young Muslim women and train them to express themselves through poetry. Her first stop was the 27-year-old Mumbai-based advocacy group Awaz-e-Niswan. “Three days a week, Roxy would visit Awaz-e-Niswan’s Rahnuma Library at Mumbra and discuss socio-political issues with us. Then she would ask us to pen our feelings,” recalls Saba Khan who coordinated the poetry workshop. Both Awaz-e-Niswan and Rehnuma Library basically counsel and educate women on their rights, and the poetry sessions held now are an adjunct of the same philosophy-a desire to be free from the oppression of men. Siddiqui, who studies at SNDT Women’s College, Juhu, says that before she joined the workshop she never realised her poetic talent. “I would occasionally read Ghalib and Faiz, but the workshop emboldened me not just to write poems but even continue my education,” says Siddiqui, who adds that her brother did not want her to study beyond Std 12, but her husband is “quite supportive”. “I am restless if I don’t write for a few days. I feel good after I have penned a few lines,” she says. Evidently, poetry-writing provides a catharsis to these girls who otherwise have limited avenues to vent their suppressed feelings. They may not take out morchas in the streets but their poems hold aloft banners of protest. Fauzia Qureishi, by far the most accomplished in this young, bubbly group, has many poems to her credit, but the one about zindan (prison) and azm (ambition) clearly shines through the collection. The long poem talks about almost everything that a girl from a conservative Indian Muslim family has to face-early marriage, the threat of triple talaq, the gruelling work at home and the restrictions put in her path. “It is not just my story alone, but my protest on behalf of all the women who are suppressed and oppressed in a male-dominated society,” says the bespectacled Qureishi, quoting a couplet: “Kab tak kisi ki milkiyat main maani jaaon/Ek mard ki pehchan se kyon jaani jaaon (For how long am I going to be considered a property/Why should I be identified with the identity of a man?). Mumbra may seem like an unlikely centre for feminist poetry but these young women are taking it there.